These technotes explain how to work around many issues with using the QNX Software Center. This guide explains QNX Software Center issues that may occur with common workstation and network setups. It doesn't discuss issues related to a particular release of the product; these are explained in the Release Notes for the version you're using. If you encounter issues beyond what's described in the Release Notes, you can consult this guide for information about issues that require advanced manual steps and extra configuration. To set up and use the product, you should read and follow the steps in the Installation Note and the QNX Software Center User's Guide. If you encounter an issue that requires manual steps that aren't explained here but that you feel should be covered in these technotes, contact your sales representative or QNX Technical Support. Which QNX Software Center version should I use? We always recommend using the latest version of QNX Software Center. To determine which version you're using, launch the product and select Help > About. The version is listed in the window that appears. To see what's the latest version available, go to the QNX Download Center, select QNX Software Center, and log in to your myQNX account. The resulting page provides a link to download the latest version of the product, and this link lists the version and build numbers. You may encounter issues when trying to download and install software packages. The following topics describe the symptoms, reasons, and fixes for various QNX Software Center failures related to package installation. There are two kinds of fixes: workarounds, which are temporary fixes that avoid the problem, and solutions, which are permanent fixes. Sometimes there are workarounds or solutions for the specific underlying problem, but other times you need to try the general workarounds given at the end. The QNX Software Center client seems to be hanging with Connecting progress at 10%. Note: In this chapter, when we refer to the server, we mean the myQNX server, which is the most used one of several server processes that the QNX Software Center client interacts with. Your internet connection is down. Solution: Check your network setup. The connection could be broken due to an HTTP proxy server. If you think that the network you're using has such a server, see Addressing Proxy Server Issues for steps on providing the proxy server's address to QNX Software Center. If connecting still isn't possible, use offline mode to install the packages. The proxy server is configured in QNX Software Center but access to qnx.com is blocked. Solution: The IT administrator has to enable access to qnx.com and fusion.qnx.com (which is on a different subnet), by adding their IP addresses and subnet masks to the proxy server whitelist. If your network has an HTTP proxy or is just slow, you may have hit the client read timeout. To confirm this, search for java.net.SocketTimeoutException: Read timed out in the latest session log file. If you don't find this string, see the other possible causes. Your QNX Software Center client may be out of memory. To verify this, open the log file for the latest use session (~/.qnx/swupdate/qnxsoftwarecenter-0.log) in an editor. In the file, search for java.lang.OutOfMemoryError: Java heap space. If you don't find this string, see the other possible causes. If you find that the client is still hanging or saying it can't connect to the server, you can further increase the heap size (e.g., to 4096 MB). Symptom: The QNX Software Center client displays an error message stating that the user isn't authorized to perform the operation. Your myQNX account is suspended. This happens if your account was inactive for a year. Solution: Contact QNX Technical Support to restore your account. Your account password has non-alphanumeric characters. Note that our current rules enforce the use of such characters; this happens only with old accounts. Solution: Change your myQNX password to contain only letters and numbers. Your account credentials are registered with different capitalization. Solution: This bug occurs in QNX Software Center 1.x. Install version 1.2.1 or later, which ignores differences in capitalization when you enter your myQNX account credentials. You updated your account password but the stored password wasn't updated so it no longer matches. Solution: Remove the stored password through the QNX Software Center preferences. For instructions on doing so, see the Manage secure storage of your myQNX credentials section in the QNX Software Center Developer's Guide . Reason: The number of activations has been exceeded. Workaround: Make sure you're not purposely activating the same license on multiple hosts (because it's not allowed). You can deactivate the license manually on the QNX website: https://www.qnx.com/account/product_de-activation.html. Symptom: The required license key isn't shown in the License tab. Reason: The required license key isn't assigned to you. Solution: Log into your myQNX account and check whether the license key is assigned to you; ask the license administrator to assign it if need be. If you're an administrator, you still have to assign a license key to yourself to use it. If the key is assigned but you still don't see it, contact QNX Technical Support. The required license key isn't shown in the License tab. No available packages are shown. Reason: Your license registration is incomplete. Your account may be in an incorrect state if you didn't download QNX Software Center from the QNX website. Solution: Log into the QNX website and agree to the EULA to complete the registration. Symptom: The client displays an error stating that it can't access the server. Reason: Even if the QNX Software Center proxy configuration works and the client can retrieve packages, remote activation may fail because the activation code supports only certain proxy types. 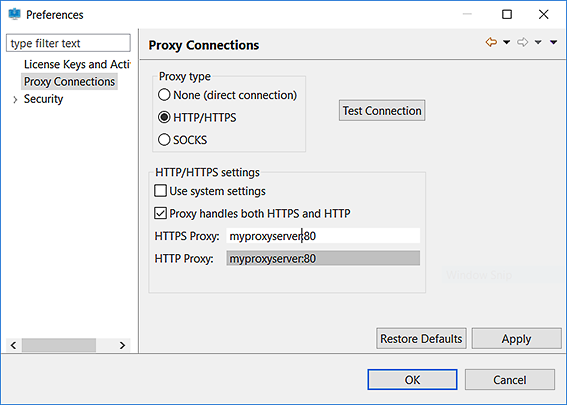 For the list of supported HTTP proxies, see Configuring proxy servers. Symptom: After you do manual activation, the QNX Software Center client displays an error saying that it failed. Reason: It appears that manual activation failed (because of the error display), but it might have succeeded. This is a known issue. In the Licenses tab, right-click the license for the product you're trying to activate, then choose Properties from the context menu. Examine the Status field. If it's Activated, no further action is required. Otherwise, contact QNX Technical Support. Symptom: The client can't access or doesn't show any packages. You haven't been assigned a license key. For more information, see License isn't assigned. You haven't completed your license registration. For details, see License registration is incomplete. If you've never downloaded QNX Software Center from the QNX website, you might not have agreed to the Download Center Usage Policy. Workaround: Log into the QNX website, navigate to the QNX Software Center download area, and click through and agree to the Download Center Usage policy. Symptom: The client can't access a specific package. You might not have agreed to the Download Center Usage Policy; for details on fixing this issue, see the last item in the previous subsection. You haven't been assigned a license key. For details, see License isn't assigned. No support plan has been registered. You are not entitled for the package. Solution: Contact QNX Technical Support if you think it's a mistake. The package is experimental and the installation is configured to hide experimental packages. Solution: Contact your QNX license manager or QNX Technical Support. The package is a debug symbol package. Since version 1.2.1, debug packages are invisible. To install debug symbols for a package, right-click its entry in the Installed tab and select Install Debug Package from the context menu. The package is invisible. Since version 1.2.1, packages of the component type are invisible on the Available tab (to unclutter the view). The package is architecture-specific and the installation is configured for a different platform. Workaround: Go the Advanced tab, click Edit Installation Properties, and in the Target Architectures panel, ensure that the platform required for the package is checked (or all platforms are checked). The package wasn't actually posted or there was an error during publishing. Solution: Contact QNX Technical Support. Symptom: The client fails to display any packages and instead displays an error stating: An internal error occurred during : "Preparing operation..."
Reason: A bug in QNX Software Center server version 1.2 when the user session has expired. Workaround: Restart QNX Software Center. To avoid this problem in the future, perform any package installations within 30 minutes of starting. Upgrade to version 1.2.1 to solve this problem permanently. Symptom: The QNX Software Center client hangs when you press Next to start installing the baseline product (QNX SDP), or there's an internal error when dealing with license activation. Reason: If you're using version 1.1 or 1.2, this may caused by the license key bug. Solution: Upgrade your QNX Software Center installation to version 1.2.1 or later. Reason: One or more packages in the dependency chain are inaccessible. For more information, see the section about not being able to access a specific package. Reason: You're trying to update packages that are in a locked group such as a locked patchset or a locked parent group. Workaround: To install the update on top of a locked patchset, uninstall the patchset package first (to unlock the other packages). Reason: A plugin wasn't updated during the last QNX Software Center self-update. Workaround: Uninstall your current QNX Software Center client and install the latest version using the installer available from the QNX Download Center. 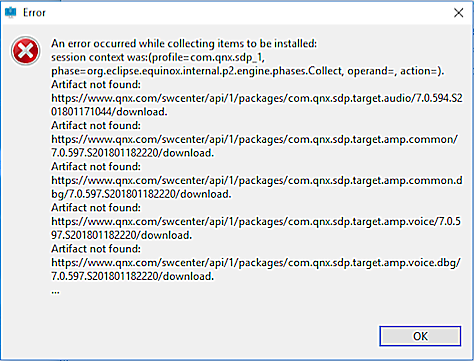 All packages and license data will be preserved (unless you previously chose to install QNX SDP packages inside of the QNX Software Center installation folder). The HTTP proxy server in your network prevents access to the server where the packages are kept. To confirm this, in the latest session log file, search for HTTP 403 error codes. If you don't find them, see the other possible causes. Solution: If do you find these error codes, you must address the network connectivity issues. Your login session has expired. This happens if QNX Software Center is idle for more than 30 minutes. Workaround: Clear the package cache and repeat the operation. Upgrade to version 1.2.1 to solve this problem for good. The packages can't be saved and retrieved successfully on your workstation. Your workstation is out of disk space. Workaround: Ensure there's enough space in your home directory, possibly by relocating the package storage to another disk (if need be, contact QNX Technical Support for details). Although rare, your anti-virus software might be interferring with packages being saved or read. Workaround: Check the anti-virus software logs and reconfigure the software to not interfere. If related log entries are found, clear the package cache. Although rare, it's possible that you have disk errors that are causing package corruption. Workaround: Run disk-checking software and reboot the machine. You're experiencing permissions issues. This can happen if you previously installed or ran the QNX Software Center client as root but now are running not as root. Solution: Remove and reinstall your product, as explained in Performing a complete wipe. The download operation is timing out. To confirm this, in the latest session log file (~/.qnx/swupdate/qnxsoftwarecenter-0.log), search for java.net.SocketTimeoutException: Read timed out. If you don't find this string, see the other possible causes. The software package is posted with errors. Workaround: Try the general workarounds stated below, including contacting QNX Technical Support if necessary. Currently, you must do this if a download error occurs (i.e., a Check Trust error, Package Checksum error, or Download error). You can also do this to clear disk space. Remove the cache directory (~/.qnx/swupdate/cache). Select Window > Preferences and then in the resulting window, select Security > Secure Storage. Click the Contents tab, select Default Secure Storage, then click Delete. When prompted, click Yes to restart the QNX Software Center. When prompted, enter your myQNX credentials, then click Save password to disk if you want to create a new storage record for the credentials. The Secure Storage dialog contains other settings but you rarely need to use them. They're provided mostly for troubleshooting and somewhat for use by system administrators and power users. Obtain the necessary packages by downloading them from the QNX website: http://www.qnx.com/download/group.html?programid=30107. Start (or restart) the QNX Software Center client. When it displays a dialog box saying that it can't connect to the server, click Work Offline. On the Welcome page, click Import and Install Offline Packages. Or, choose File > Import. Either action launches the File Import Wizard. Follow the instructions in the wizard to install the packages. Note that you may have to select multiple packages to resolve any interpackage dependencies. For details about this mode, see the Work offline section in the QNX Software Center User's Guide . Obtain the packages by other means (e.g., a QNX contact person). Note that group packages have no payload; you need to obtain all of their children. Don't add the z option to the tar command. The first time you try wiping the QNX products from your host development system, you may want to skip the optional steps (to see if the simpler procedure fixes your problems). If the usability issues persist, you can then try an in-depth wipe by doing all of the steps. Select it in the top-right dropdown shown next to the gear icon. Click Remove Installation in the bottom right corner. Click OK at the confirmation prompt and wait for QNX Software Center to remove the baseline installation (this can take a couple of minutes). Deactivate all of your licenses by going to the Licenses tab, selecting all licenses in the list, then clicking Deactivate in the bottom right corner (and Yes at the confirmation). Exit the software by selecting File > Exit. Optional: Uninstall QNX Software Center using the uninstaller located in the installation directory, then reinstall the software by downloading the latest version from our website. Remove the software update directory (~/.qnx/swupdate/). Open QNX Software Center and select Window > Preferences. In the left-side navigation, select Security > Secure Storage. Click the Contents tab. The secure storage directory is listed at the bottom. Optional: Remove any detached installations. An installation of QNX SDP 7.0 or another QNX product is detached if the QNX Software Center doesn't see it. In this case, you must manually uninstall it and remove its folder from the filesystem. Restart QNX Software Center (if you haven't already) and try reinstalling the baseline product and any packages you need. If your company uses an HTTP proxy server to control internet access, the QNX Software Center can usually detect it automatically and communicate with the necessary QNX servers upstream of the proxy server. Sometimes, though, you have to manually configure the proxy server or provide proxy credentials. The procedures given here help you address these and other connectivity problems. The QNX Software Center queries this server to discover and download available packages. This server is queried to discover any licenses the user might have, and to remotely activate or deactivate those licenses. This server is used only by customers who have floating licenses. All communications with the myQNX server and the QNX license server occur over HTTP and can be mediated through an HTTP proxy server. The floating license server, however, uses a proprietary protocol that isn't affected by proxy servers—it works only over direct connections. Make sure your workstation is connected to the internet. Try accessing www.qnx.com from your workstation web browser. If that fails, ask your IT department to give you access to our website, either directly or through a proxy server. If you're using a macOS host, configure the QNX Software Center to use the same proxy settings as your web browser, as explained in Manually configuring proxy settings. If the QNX Software Center prompts you for proxy server credentials, follow the steps in Entering proxy credentials. Note: When the QNX Software Center prompts you to log in to myQNX, you must use the same credentials as when logging in to https://www.qnx.com/account/login.html. If you can log in to this site through a web browser then you can log in through the QNX Software Center. 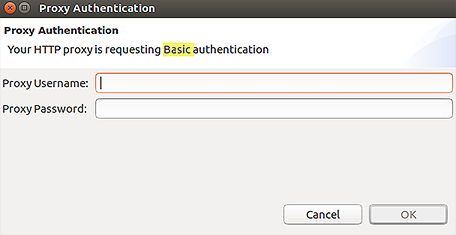 There's an issue in version 1.0 that prevents you from using uppercase characters in your login credentials. So, always enter your login name in all lowercase characters; for instance, use myusername@mycompany.com, not MyUserName@mycompany.com. The QNX Software Center creates a log file that QNX support staff can use to diagnose networking issues. You can find this file at ~/.qnx/swupdate/.metadata/.log. The QNX Software Center usually picks up proxy settings automatically. However, some proxy-OS combinations can be problematic. In particular, on macOS, you need to configure the proxy settings manually. 1 The QNX Software Center can't detect your proxy server credentials; it will prompt you to enter them each time it starts. 2 The QNX Software Center can't communicate with the QNX license server over proxies that use Digest or NTLM; you must therefore activate products manually (for details, see the QNX Software Center User's Guide ). In general, you shouldn't attempt to manually configure the proxy settings, because usually the default settings picked up from the OS work. However, on macOS, you need to enter the settings manually. On any host OS, you may need to experiment with manual settings when troubleshooting proxy connection issues. Note: The SOCKS option is available but not supported. Under HTTP/HTTPS settings, uncheck Use System Settings. In the HTTPS Proxy text field, enter your proxy address using the format proxyhost:proxyport. Click Test Connection to verify that you can connect to the myQNX server. You may be prompted for proxy credentials and may expect the check to take a few seconds. Information on providing these credentials is given in the next section. Click OK to apply your changes and exit the window. If your host is downstream of an authenticated HTTP proxy server, when the QNX Software Center attempts to connect to the myQNX server, you'll see the Proxy Authentication window. This window asks for proxy credentials, and indicates what type of authentication your proxy is requesting, such as Basic, Digest, or NTLM. If you see this window, enter the proxy credentials for the HTTP proxy server in your corporate network; these are the same credentials that your browser uses to connect to internet sites. Note: Don't supply your myQNX credentials at this point! If you enter the correct proxy credentials here, the QNX Software Center will subsequently prompt you for your myQNX credentials. You can enter the same proxy credentials used by your desktop browser, but it isn't always obvious what those credentials are. That's because web browsers and other HTTP applications often supply the proxy username and password automatically. In many corporate networks, the HTTP proxy server is integrated with the corporate network login mechanism. So, when prompted for your proxy credentials, try using your normal network username and password; for instance, your domain username and password on a Windows network. If you can't guess your credentials, contact your IT department. ©2018, QNX Software Systems Limited, a subsidiary of BlackBerry Limited. All rights reserved. BLACKBERRY, EMBLEM Design, QNX, EMBLEM Design, MOMENTICS, and NEUTRINO are the trademarks or registered trademarks of BlackBerry Limited, its subsidiaries and/or affiliates, used under license, and the exclusive rights to such trademarks are expressly reserved. All other trademarks are the property of their respective owners.